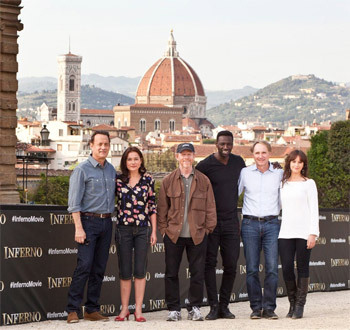 Principal photography has commenced on Inferno, the new film in Columbia Pictures' Robert Langdon series, which has taken in more than $1.2 billion worldwide to date. The film is slated for release in Australia on October 13, 2016. In the film, Academy Award® winner Tom Hanks reprises his role as Robert Langdon. He is joined by an international cast of actors, including Felicity Jones, Irrfan Khan, Omar Sy, Ben Foster, and Sidse Babett Knudsen. The film is directed by Ron Howard and produced by Brian Grazer and Ron Howard. The screenplay is by David Koepp based on the book by Dan Brown. The project's executive producers are David Householter, Dan Brown, Anna Culp, and William M. Connor. Inferno continues the Harvard symbologist's adventures on screen: when Robert Langdon wakes up in an Italian hospital with amnesia, he teams up with Sienna Brooks, a doctor he hopes will help him recover his memories and prevent a madman from releasing a global plague connected to Dante's 'Inferno." Commenting on the announcement, Howard said, 'I'm so excited to be starting production on our third Robert Langdon film. Audiences everywhere have shown a tremendous appetite for the Robert Langdon adventures and Inferno has all of the intrigue and action they could want." The film will be shot on location in such exotic cities as Florence, Venice, and Budapest. Howard's production team includes Director of Photography Salvatore Totino, Production Designer Peter Wenham, Editors Dan Hanley and Tom Elkins, and Costume Designer Julian Day.